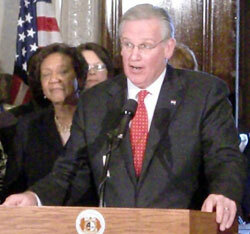 In fact, it was Governor Nixon. We’re sure it was. Governor Nixon had a news conference outside the Governor’s Office yesterday to talk about how education leaders can help him reform the state’s tax credit system so that the state does not forego millions of dollars in taxes that could be instead going for schools. We’re not sure why he had this event outside the Governor’s office. At the Capitol. Normally when he has a news conference outside the Governor’s Office it’s WAY outside. He has spent the best part of the last four months making announcements—or, more accurately, repeating announcements—all across the state. This was most unusual. We’re not sure why he didn’t going to various college campuses and elementary schools to make this announcement, in keeping with his recent touring habits. But it’s good to see him again.